New Mexico’s governor, Bill Richardson, signed a bill that abolishes capital punishment in that state—at least henceforth; the two people currently on death row in the Land of Enchantment will stay there. For crimes committed after 1 July of this year the maximum penalty will be life in prison without the possibility of parole. New Mexico is the second state to abolish capital punishment since the U.S. Supreme Court reinstated it in 1976. New Jersey did so in 2007. The state used the death penalty very sparringly, only executing one person since 1960. Richardson said that over 12,000 people contacted his office by phone, e-mail, snail mail, or in person; over three-quarters supported repeal. While he used to support capital punishment, he cites the possibility of executing an innocent person and the racial disparity in the penalty’s application as reasons for abolishing it. There are now 15 states without the death penalty; two of them, Nebraska and New York, had existing statutes declared unconstitutional by their Supreme Courts and have yet to pass new laws. About 22.25% of all Americans live in a state without the death penalty. Many others, including Maryland, are considering abolishing it. 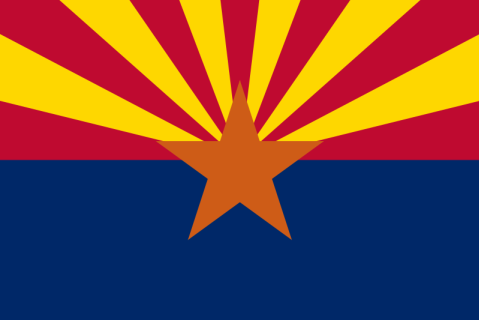 Arizona has a good flag. But don't worry, I'm sure there'll be news from a state with a lame one soon. CNN indicates that Barack Obama is going to air ads in John McCain’s home state of Arizona. They say that Arizona would be a key swing state if not for the fact that McCain is from there; the Republican only leads 49–45 with 6 percent undecided. McCain’s residency and his long representation of the state in the Congress is probably worth at least 4 points; the state would probably be looking bluish, like neighboring New Mexico and Colorado if the GOP had nominated someone else. Intrade speculators think it is 4.35 times more likely that McCain will win Arizona than that Obama will do so. However, they may not have had time to factor in Obama’s latest decision into the pricing. In any event, Obama’s only goal probably isn’t to win Arizona’s 10 electoral votes, though I’m sure he wouldn’t mind them. He’ll probably consider the expenditure worth it if it simply creates the impression that McCain is embattled and struggling even to win his home turf. Hmm. It seems to be working. Readers may recall that Democrat Al Gore lost his home state of Tennessee in 2000; had he won it, he’d have been president.